On Friday, I was a lone nut in the wilderness suggesting that there was a good chance Thursday's high marked the top. After the action on Monday and Tuesday, all the sudden a lot of folks have piled on that bandwagon. That makes me uncomfortable; I don't like crowded trades, and neither does the market. I'm not saying that the top call is wrong, just because there's a lot of people joining in now; in fact, quite the opposite: I'm still favoring it. But the market never makes things too easy... so, sometime soon, we should expect a curve ball to throw everyone off the trail. Tuesday played out largely as anticipated, so no big surprises there -- but I'm not completely sold on the structure the market has shown us so far. I would really like to see at least a marginal new low to give this move down a more concrete five-wave structure. 1) It was waves 1, 2, and 3 with 4-up in process and 5-down to come. 2) It was a complete wave with an extended fifth wave. 3) It was an a-b-c corrective wave. Of those three options, I like option 2 the least because, even though it's possible, it throws the structure way off balance and I don't like the "look" of it. So, for the bear case here, I would really like to see at least a marginal new low for this move. After that, I would expect to see a decent snap-back rally. 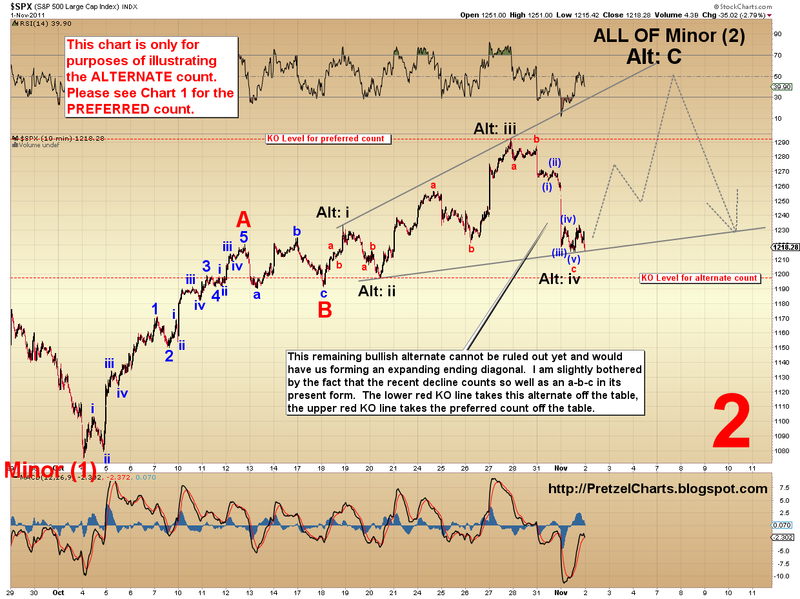 The bullish alternate count I suggested yesterday as an outside-shot wasn't weakened a bit by Tuesday's action. The move down from Thursday's high counts very well as an a-b-c in its current form, which is why I would like to see a new low, preferably below 1197.34, to knock that count out. If we don't get a new low, calling Thursday the top will remain a little bit inconclusive for the time being. For this update, I have drawn up two radically different SPX charts. Chart 1 (marked by the big red "1" -- no affiliation with the movie of the same name) shows my preferred view that Thursday was the top, and an estimation of how waves 4 and 5 might unfold if that's the case. If you'll refer back to the three options listed above, this chart shows the first two of them. Option 1 is illustrated by the blue lines and yellow target boxes: this is my preferred view, and what I would "like" to see take place in order to confirm my underlying assumptions that this is the start of a big leg down. Option 2 is illustrated by the black lines and black "Alt: (i); Alt: (ii)" labels. 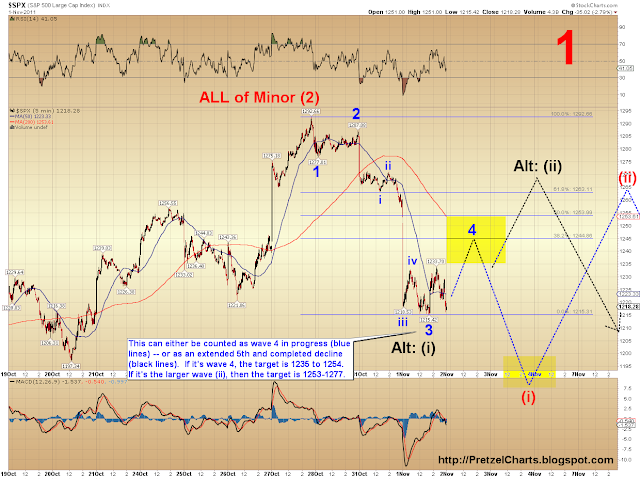 Two levels to watch are the 1230 area, above which favors the bulls; and the 1220 area, below which favors the bears. These two areas have been pretty important battle grounds in the past, and on Tuesday the market just bounced back and forth between these levels all day, further highlighting their importance. Chart 2 (marked by the big red "2" -- no affiliation with the less popular, direct-to-video sequel) illustrates the alternate count in clearer detail than I did yesterday. It came to my attention that a number of readers basically had no clue what I was talking when I suggested an "expanding ending diagonal," so this has been drawn to help clarify. It also shows how the decline could be counted as an a-b-c. This count still holds at 20% odds for the time being, although with a little luck it'll get knocked out completely in the next few days. The Nasdaq 100 (NDX) is in a similar position to the SPX. I have only annotated one chart for the NDX, which illustrates my preferred count, since the two indices should trade in pretty similar fashions. The NDX in particular looks to me like it needs a new low to complete the move and give more weight to the bear case. Note the island reversal top, which is formed by the exhaustion gap up on the 27th, and the gap down yesterday. Despite being fun to talk about, island reversals are, surprisingly, not very reliable patterns for marking trend changes -- so don't read too much into this one... yet. Beyond the charts, we have the Fed due to announce a bit earlier than usual, at 12:30 EST today. At 2:15 EST, Bernanke will hold his press conference detailing the Fed's plans, and might even suggest some innovative new ideas on how to further destroy America. I continue to be of the opinion that there will be no QE3 at this point in time, but, regardless of what they reveal, the market often behaves unpredictably around Fed announcements. After the last announcement, the market initially sold off very hard, then abruptly and strongly reversed, in a bear trap. If we got a similar result here, that could form wave 5 to complete (i)-down, then reverse into wave ii-up. Either way, if you're planning on playing the Fed announcement, stay nimble... and trade safe. Excellent! Your 3 counts from the top are the same as mine. Now if it was by chance the extended 5th count then we should expect wave 2 to end right around wave 2 of the extended 5th? Is that right? Yes. Also the retracement after an extended fifth is often a complex, double retracement. So that could generate the confusion I'm expecting. FWIW the extended 5th count is my preferred. Fits best with my cycles work. ES futures battling it out at 1230 again. Just took a small short at 1230. Looks like a bearish wedge breaking. "They" are trying to turn that wedge into a channel. We'll see if I get stopped. So what does your cycles work suggest, time-wise? Good evening/ morning P. What tool do you use for watching the futures? Yes Vulture is correct 11/4 +/- 1 looking for a top. Spiker... I just use my optionsxpress streaming charts mostly. Gotten used to using it over the years, so even though it's not the most comprehensive thing out there, it works great fer me. CTP, I was thinking of putting together some of our past suggestions/comments in an "advice for new traders" type page. What do you think? I would, of course, credit you for your suggestions. Yes trying to put some skin to the bones of my cycles, I would say buying on Fed joy and then selling on ECB despair (ECB meeting Thursday morning). Yep, as long as your account is approved for futures trading and you meet their margin req's. think we'll fill that gap from 1246 to 1253 by the end of the day? really considering putting shorts on around 1250. Question to PL: why is a break of SPX 1197.3 required IYO for the preferred fifth wave ending, why not just going under yesterday's print low of 1215.4 ? Not required for the preferred 5th wave ending... required to knockout the bullish alternate count. I should say, hold the breakout today from yesterday's consolidation. Speaking Pennsylvania Dutch in that post... "Throw the horse over the fence some hay." If the bulls lose 1230 with any conviction, we'll probably get those new lows. Right now, it looks like we're in wave 4-down of c-up of 4-up. These gaps can mess with the counts, though. The H&S on the intraday charts still looking like the SPX is forming the right shoulder right? 1. what was bottom of yesterday's consolidation? 2. wave 4 is already fullfilled, according to your minimum count of 1236 (1237.97, minutes ago). So it can turn downward at any time now, to fullfill w5, correct? 3. therefore, the area between yesterday's consolidation(#? ), and 1238, has now become noman's land, correct? Frank, yes. Could also form a smaller h/s between yesterday and today's moves on the 5 min. Great blog pretzel. From all todays charts looks like higher tomorrow or next regardless whether newer low or not? 3) Not exactly sure what you mean. R2K's resistance in the downtrend channel from recent highs is near 728 -- we came close and rebounded down off of it -- I have my eye on this as one of the signs that the market wants to head back to the SPX 1256 area. I'm still hung on the idea that we need to fill that virgin space from the gap up last week and the gap down yesterday...1246-1253...cash session has not printed in that zone at all! How big of a magnet will that zone be? I guess we can still drive lower for wave 5 before we correct back up to it for an ABC wave 2...or maybe just leave that gap behind all together. btw Pretzel, today's article was a very good one...top shelf again. Right now, I'd say yes, that's what appears to be underway -- although I don't do time projections, just price. But keep in mind I can only project what looks likely based on what's happened *so far*. Today's projections are based on yesterday's moves, and tomorrow's projections can change based on today's moves. Opposite to financials Biotech sector is the huge laggard and is killing NDX performance today. Apparently TEVA earnings stunk this morning and is hitting the entire sector. Somewhat under the radar obscured by all the Euro hype, it is interesting to note that $SSEC (China) has not succumbed to any selling pressure the last 3 days despite being at it's 50 day SMA resistance. I would have expected a sharp rejection from that resistance in sympathy with the sharp declines in other world markets. That is didn't happen is curious and even more curious is that nobody seems to have noticed. To me, recently, the "tell" is coming out of Germany, because I consider that they know best, what is really happening in Europe. So I watch the DAX, and most especifically, it's biggest bank: symbol DB (Deutsche Bank). DB has been creamed since it's Friday's close at 46.85. By Tuesday's opening, it opened at 36.84, a whopping crashlike 27% drop, in only 1 day of trading. Twenty seven percent in 1 day. Since then, it has feebly attempted to rally, yet has only managed to get to the mid 39's, area where it is stuc right now. And only 4 days earlier, it nearly hit 48... Which now appears more like a blowoff high, than a breakout. IMO, this does not bode well for Europe, and by proxy, the rest of the world. Yes Pretzel it makes sense. You set level expectations, but if the market decides to do it in a hurry then the time expectations are irrelevant. BTW the levels you set...I noticed you use fibs today, any other ways in which you determine where indexes could reverse? CTP - I haven't done a study on this, but I've passively observed that china's markets have traded differently than the rest of the world markets recently...China has been declining hard since February, so the bears there could be low on ammo by this point. speculating. Also good "tells" can be ones that don't fit with the picture being presented by the market as a whole as they can alert you that something is quite not right about the consensus viewpoint. In that regard I am going to be watching $SSEC like a hawk over the coming days because IMO if it fails to follow the rest of world markets that could be an important clue in regard to the longer-term big picture wave count. Could be... or it could also be an leading indicator is at was when it bottomed in October 2008 while the rest of the world waited until March 2009 to bottom. James, fibs, wave calculations, support/resistance, etc.. Elliott formulas like c=a; c= 1.618*a; 3= 2.618*1; 5=1; 5= .382*1-3... there's a bunch of 'em. I use a combination of things. A lot of Elliotticians just use the Elliott formulas, but I like to mix it up a bit. I've always been a big fan of the DAX. Had a lot of success in '08 by cross-market studies w/ DAX. SPX starting to look like it wants to roll over soon... maybe 1245ish first, then roll? yeah, rollover at 1245 would make a nice little abc correction. CTP - true, china could be a leading indicator, they also started to rollover in feb this year where the rest of the markets didn't rollover until much later. Good breadth today. Midcaps and Smallcaps leading. Thanks for a great blog. As a new trader I wold very much appreciate "Advice for new traders". May I ask how tight stop you used on your short trade mentioned above (1-3%)? I followed the discussion yesterday- about trading and blowing accounts. Interesting and scary. Being new I am obsessed with avoiding losses- to the degree of "freezing" in the moment of action. My biggest problem is entering new orders. God advices say I should find my preferred way, edge. (Feels like inventing the wheel all by my self). Being a monkey see monkey do type I find little comfort in this general advices. It is said to be impassible to execute orders perfectly but then gains/ losses depend on the order execution. Like, looking on the charts from 2810 if I wanted to short when should the order have been executed? At the open?, close?, of which day? When the market moves like a bullet (gaps up or down) train and I "freeze" its frustrating. So what is the Edge? Any good books, written stuff on order execution- anybody? Frank, hopefully, that's about to change soon. looks like this area of 1230's-1240's will be the range, until the Fed announcement at 215pm est. is released. Then, it might dive down for a new whipsawing wave 5 intraday low. However, it might keep going down for the rest of the entire day, since the result of today's greek referendum EU meeting is still up in the air, and at what time (if anytime today) it will be announced. Remember what we discussed yesterday. Majority of traders are hungry for another Mega-trend after being trained to expect them the last 3 years. But the market is not here to cater to the wants and needs of the majority. The market's function is to inflict maximum pain and frustration on the majority and it does that quite well I might add ;-) ... That is what makes this game so challenging. pretz, i like your preferred count; i was more pessimistic and thought we'd hit (i) sooner, but i see now that we need a 4 first to get there. otherwise, this market is so choppy and nervous (we've not gotten anywhere since mid-october...) it's a tell tale IMHO that the only way is down. please anybody enlighten me of any previous jittery markets that have gone North. I just don't see that happen. arnie - summer 2010 did a real fake out...looked like it wanted to drop but went higher. Money printing can change everything. well, atleast it can change price action, not necessarily the fundamentals. The stops I used were super-tight, it was just a quick stab-type trade and I used the most recent 1 minute swing high as my stop. A few good books I recommend are posted in the "Recommended reading" page on the right sidebar of the blog. If you order through that link (you can add other books that aren't listed there too), I get a few bucks from Amazon. As to just starting out trading... there was a book I read about 11 years ago, and now I'm trying to remember the title... there, found it and added it to my bookstore for you: "A Beginner's Guide to Day Trading Online." That's a pretty good introductory course and covers most of the basics. It's on its 2nd edition now, but the first edition was pretty good, so I imagine the 2nd edition is even better. CTP- I agree about max pain and frustration. We'll get another trend soon enough... of course, "soon" being a relative term. The question is how many new traders who jumped in recently will be left standing when it finally gets here, IMO. In my view, that's what the last 3 months have been about. I think a lot of people saw the first big leg down, and said, "Ooh, bear market like 2008! I want a piece!" or "Ooh, bull market correction! I want a piece!" So the market is chewing them up for a while here, and taking their money. Once most of them get blown out by the big money traders, then the way will clear for the next serious move. Pretzel, doin an all nighter with the fed statement coming? this 1240 level has me confused...why would it be resistance? I can't see anything significant. Feels like "no man's land"
Rocky - you are absolutely right, but I would be very surprised if the FED's QE3 will be of the money printing kind, if any at all. With the NDX just now squeezing into the 'target zone', does that help to confirm that we have at least completed the requirements for wave 4 up? With 4 being a soon to be (or perhaps already) completed a-b-c wave? 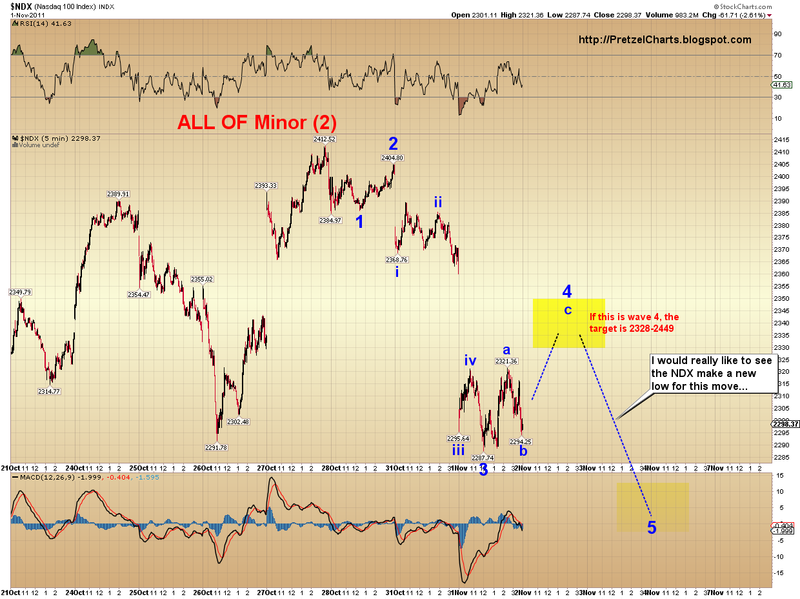 And we should therefore now be expecting a wave 5 down under the 'preferred count'? A shout out to Brian for his generous donation! only one question: Does Greece want to remain in the Eurozone. planning must be held no later than December. technicalities of the bailout plan. widened sharply to new euro-era highs. likely to run out of cash by the end of the year. contagion to the rest of the single currency bloc, at least slightly. with Juncker, Lagarde, Barroso, Van Rompuy and an official from the ECB. They will all meet with Papandreou at 1900 GMT/1500 EDT. It *feels* like the market is essentially not sure of where to go from here. And this a good spot to hold everything in a kind of suspended animation (for the moment). Any thoughts there? My personal suspicion is that after a minor move up following the Fed meeting, we see another move down. But it's just a suspicion. Last Monday I thought we'd head up for one more minor leg higher before the wave down commences. We have completed the min. requirements for wave 4 up. But this market is so masked right now, personally I'm not even considering any trades so far today, other than maybe a quick scalp here or there. Wow, you are fast. Compared to the education and insight I've received, the amount donated is rather trivial. I've been following the discussion here quite diligently since just prior to the recent run up from the early October lows, at which time I went long heavily on Monday, October 4th. And then got out last Wednesday and Thursday, which was perhaps a bit early. But I feel good about it. I am mostly observing before I jump into the conversation and comment fray here though. It took me a few weeks to really get a feel for basic Elliott Wave terminology and to be able to follow the evolving counts. And hell, I’m still just getting it. Which means of course that I am a 'newbie' in every sense to E-wave theory. I definitely GET the underpinning psychological structure though. That part is what makes the most sense to me. The natural course and undulation that hope/greed and fear/despair will tend to follow on a mass market level. If you can follow the market’s general psychology, it seems you can follow the counts rather as a matter of course. What insight I can offer here may be of limited value. But I tend to be very good at feeling out general market sentiment. And especially for having a good feel for when market a bottom is at hand. Tops have always been harder for me, because they are marked by wild irrationality and implausible hopes (which I have entertained on numerous occasions myself) . . . and who knows where that’ll stop? Whereas bottoms are when rationality coupled with fear tend to reach a mutually coupled and discernible zenith. Since the August crash and waterfall, it was easy to simply trade off of the every other week or so lows that were set for virtually every major equity between August 10th and 12th. And then I could then just set stop orders once we reached S&P 1,2o0 or Dow 11,400. Now that range is blown, but these levels just don't *FEEL* real or sustainable to me. Which I know is not a definable or provable thing on a chart. To me the current market environment FEELS a lot like it felt last July and the beginning of August: totally based on hope and sentiment driven by the chimera things being 'alright' and better times may be around the corner (and once this Euro debt business is 'contained'). Meanwhile the structural economic problems have no real-world solutions. None that are reality-based anyway. All of which is underpinned the by another chimera: Earnings, GDP growth, and things at home aren't so bad as they 'could be'. And now maybe heading into the holiday season and end of year, we'll inch along better than the last few months. Recession is (seemingly) staved off. And it’s the season for strong market rebound anyway, right? So I am now sitting on the sidelines just watching for the next indication about where we are headed from here. It 'feels' like we are now (finally) at that major 'crossroads' point of where the market will pick a direction, whereas before this week it really didn't ‘feel’ that way to me. Yeah, unfortunately so far the market hasn't revealed much more than I figured on after yesterday. There's really nothing to clarify whether this is the 4th wave or the start of ii. You may be right that the market hasn't made up its mind yet... so after the Fed announcement, it can turn this morning's move into whatever it wants. Fed statement is out, basically no changes or surprises. Pretty well summed up in the expression, "Bear markets slide down the slope of hope..."
Every bear has that ever-present, "Things will get better soon, all we need is... (X). Once that's fixed, it'll be just like the good ol' days!" At least, right about until the middle of the big third wave down, at which point it shifts to "OMG, it's the end of the world! We'll never recover!" Most people are only capable of projecting the future in a linear fashion. It's this same trait that causes rock stars and atheletes to end up broke only a few years after their careers peak: they planned their futures and lived their lives as if they would make 10 million a year forever. So, yeah, the masses rarely have it right because they can only make linear projections. And I agree that bottoms are easier to call than tops. The patterns are usually much cleaner at bottoms... probably because the sentiment at tops creates a lot of noise. Oh, I don't know that I'm 'right'. I wasn't right earlier this week. I thought there would be one final push higher over 1,300 (though I got out last week anyway) to totally push irrational sentiment over the top. And to get all last remaining bulls who don't want to miss out to pile in en masse and be trapped before the boom gets lowered. It just seems at the moment that this is a safe, neutral place for things to hold tight. And to reveal nothing about what might happen next. The minor 'rebound' today gives (what I believe are false) hopes to bulls and longs and keeps them from bailing in a huge way. Which is what a bear should want, actually. And also staves off the bears at least momentarily from moving in with a vengeance, given the possibility of a near-term move back up past 1,250. What seems completely certain though: There is NO CHANCE that we are hanging out here for very long. I wouldn't be surprised by a minor move up that keeps the bulls feeling okay and things are going to be fine . . . which is the perfect place to REALLY have a major run down. In today's environment a few well-placed headlines out of Europe starting beginning of next week would commence the panic selling en masse. Especially with earnings season behind us and bulls basically all in with no bullets left. And a good place to start that panic is with the S&P at least above 1,250. My non-technical view of things. The market is still not moving much after Fed statement... maybe the traders are still at lunch? CTPtrader, when you have the turn date like 11/4 +/-1, do you usually wait for a level to jump in for your shorts on the -1 day? Your non-technical view would jive with the idea that this is wave ii up. That would set us up for a bigger move than the first leg down off the highs in wave iii which is almost always the point of "recognition" in some form. This would ultimately form 5 waves down to complete Minute (1) of Minor (3). As a general rule, Minute (1) should take out the October lows, at which point we'd get another large counter-trend rally to set up Minute (2)... then it really starts getting ugly. Sorry, my last post is lacking in punctuation, apparently I ran out of commas for a moment. I'm going back to that 1230 +/- level here... I still think if bulls can't hold it there, we'll probably see that 5th wave down, and the preferred count will come out victorious. That is where other TA comes in such as e-wave to help me refine exit and entry within the cycle turn windows. Bears need to step on the gas right here. What I meant was- expecting the market to go down but not knowing when or how as on october 27 when was I supposed to go in, execute a buy order for a short position? 28 oct was flat, 31 gapped and then was flat, 01 nov gapped even more and then zigzagged. It is a silly question but I did not manage to trade this last opportunity. Fed laid an egg with statement that basically said "we are asleep at the switch and behind the curve"
With a dovish dissent that is shades of 2008 the last time Fed was behind the deflation curve. The beard better come up with something good at the news conference or things are going to start looking real bearish with such a pathetic bounce into 11/4 +/- 1 cycle. Bulls puttin' up a little fight here at 1230. I think Bernanke is going to suggest that the Fed invest in Beanie Babies. That was a great bubble back in the day, I see no reason why the Fed can't bring the craze back. So short-term-looking-in-the-mirror-view shows an uptick (no surprise; and this has already happened so nothing you can do about), while the (long term) future view(no surprise; hasn't happened and thus something you can do about) shows big risks, and thus we -the FED- do nothing. Makes no sense. Don't worry about "missed opportunities" -- the market will still be around tomorrow. You just need to figure out a system that you're comfortable with... or follow someone who has a system that you're comfortable with. it seems some of you have picked up on my no man's land comment earlier today. ww1 trench warfare, step by step gas death. good article on greek situation today, ctp. I will give you a better one, a long one, though not timely, it is from oct. 2010, vanity fair, on 21st century greeks. "beware of greeks bearing bonds", by michael lewis. it is extraordinary, explains the entire 21st century money-for-nothing-and-my-chicks-for-free steroid-zorba modern day greek mentality. plus, the greek finance minister himself was not educated in greece, he was educated -for 2 decades- in nyc, london, and paris; so believe me, he is a major international player. And what game they are playing right now, is for high political stakes. My guess is they want a better deal, since they know they have all of Europe, by the cojones. And as the old sayin goes, if you have them by the cojones, their hearts and minds will soon follow. But of course, there are always assasinations, by lone "crazed" individuals. So, these greek market savvy politicians, are playing a nasty dangerous game, in messing with all of Europe. So I predict some "strange" deadly accident, will soon befall these 2 greedy greek politico fools, prime minister and finance minister. Maybe a "bizarre" plane crash, on the way back home to the Parthenon. Well my 'non-technical view' is truly just guessing at market sentiment and most importantly: What outcome is most heavily incentivized by those who move actually markets? If I'm in a position to move the market from where we are at currently, it seems a LOT easier and more profitable to take it lower from here than higher. Where's the liquidity going to come from at this point for any kind of truly sustained up move? But if DOWN is where I really want to go, then taking it up for a spell and to keep the bulls and general public lulled is a good idea. If we move up a bit from here, then doesn't that create the (mis)perception that the 'correction' that just happened early this week was 'healthy' and 'to be expected', but no big deal and now we can get back on to moving higher into the holiday season and in time for Thanksgiving? It's the PERFECT trap. If only because a modest recovery past 1,250 to 1,270 is reassuring to longs, who then won't want to miss out what will believed to be forthcoming holiday season gains. Think what another 200 point Dow up day would do to sentiment: Bulls could tell themselves that they just beat back a seemingly unfolding bear run earlier this week. Market experts can write articles about how the holiday season bull run is underway . . . and you don't want to miss out. It's pabulum for the masses. I don't pretend to know what's going to happen, but if I have the resources to control the market's movements AND I can dictate what is the IDEAL money making scenario for ME, then it's another minor run up to lock in sentiment and hopes. And thus emptying every last bullet that could be chambered in a bull firearm (bad pun intended), which is then followed by taking out my Bear tanks and bazookas and mowing down every defenseless bull in sight. It's what I've been saying all year: the Fed's hands are virtually tied here. They've already shot all their bullets, and nothing has come of it. What exactly do they have left? Drive inflation through the roof w/ QE3 and kill what's left of the economy? Fed tends to be reactive to things, not proactive. I was hoping that the Fed would announce QE3 officially, see the rally run up to retest the high last Thursday and fail again... then there is really no more reason to be bullish :-) At some point the QE is becoming like morphine shots, just prolonging the inevitable. But Fed likes to keep its arsenal of tools ready for the worse down the pipe I guess. Sorry, my last comment was in reply to Arnie. I have a habit of not addressing my replies sometimes. This is another reason I think we're in the beginning stages of the mega-bear. The Fed is essentially powerless, and the world governments are broke. Somewhere in the not-too-distant future is where the masses begin to realize that there's no backstop to anything right now. Who's going to bail out the US Treasury? Europe? And so on. It will be Lehman Bros. on a multi-national level. Just MHO. You still have your BIDU short position open? Look at all these dojis the last few days. Even a positive earnings report wasn't able to push it up through 150 - 151 resistance. I think it can be shorted here. probably see a bounce here off 1226... so what happens next will hinge on whether the back-test can hold it under. 1230-1232 seems to be the key battleground now. pretz, you are right. all the FED's arsenal in the world didn't do much as unemployment is still stuck at 9+%... 110K jobs added on 14M unemployed does nothing really. Again a big question: do you see deflation down the pipe or inflation? Recent strength of USD and falling commodities price seem to suggest a deflationary environment. But the logic of more QE seem to suggest hyper inflation down the pipe. Either way it's a mega bear! Setting up Minute (2) eventually huh? I was able to follow your scenario if this was actually an unfolding wave up, which I think the Fed announcement just cut legs out from under that scenario. If I'm understanding correctly, your 'prefferred count' is what's in play with the market now firmly heading south. And yes, Fed being out of bullets is right. They never had any real bullets anyway. Seems rather apparent that Bernanke's been firing wax/rubber ones all this time. What happens when both the market movers AND the public realizes on a mass level that there are NO bullets left for ANYONE to fire to prop up the unfolding farce of marginaleconomic improvement any longer? I suppose that's what happens sometime around the mid-point part of some future (and massive) third wave down. I can tell you this, unless someone here was a player in '29, none of us have ever seen a crash at this wave degree. If you remember how terrifying '08 was, I believe this will be quite an order of magnitude worse. If this is, instead, my alternate Grand Supercycle top... well then no one alive has seen a crash at that wave degree. Whoops, lmao -- ever was right. I need to get to sleep, my brain (brain, not Brian) left the building about 2 hours ago. pretty scary stuff. brimstone and hellfire cometh thee! I think we'll see deflation. Default is deflationary. All that money suddenly vanishes into a black hole. That's what happened when Lehman went under... basically everyone Lehman owed money to suddenly had to adjust for that money disappearing. Balance sheets had to be adjusted, and assets had to be liquidated to make up the shortfalls. Everything got sold in the scramble for cash. Imagine what happens when entire governments default and all the money is destroyed. Best I can do at my current level of awareness. Just to add: when cash is what everyone wants, assets become cheap and cash becomes more valuable: that's deflation. Simple supply and demand economics. btw, if that was an a-b-c up, it should turn back down right here at 1233. So, look on the bright side, if we can play it on the way down, we'll have lots of cash at the bottom! And we'll all be able to afford only the finest candles in our outhouses! Bulls make money and bears make money. I'd rather make money as a bull to be honest. The whole world is happy and parties are everywhere. Making money on the long side is a lot less stressfull too. Well I guess I can't order the market to execute my wish, the market just is. Our only choice is to follow it. At least the Fed has publicly recognized that this economy has stalled with low growth. That is a big concession to the truth when they would prefer to rally consumer confidence with upbeat news. Frank, I closed it last friday at 143...a little worried about their earnings momentum...looking at CRM as a possible short now. CRM is down on an up tape while bidu is up. Frank, believe me, I would rather make money as a bull too. I've got 3 kids who I'd like to see grow up in a nice world. The problem is, the government has had us on a very dangerous path for years. And at some point, excesses need to be balanced. Unfortunately. I don't make the rules, I just try to navigate them as best I can. And the first step to navigating is to be able to see your environment clearly, so you can respond accordingly. But, believe me, I wish the situation were something other than it is. The VIX spiked to a level over 80 in 10/08. Since VIX didn't exist in 1929. Do you have any idea that if your mega bear scenario does pan out what's the potential of VIX? Beside, Frank, like Spiker said: this isn't the bear to end all bulls. Collectively, this country (and the world) needs to fix all the mistakes. The first step toward fixing mistakes almost always involves paying for those mistakes. That's when everyone realizes it was a mistake... when the consequences show up. I'm a great believer in the human spirit, and I firmly believe that we will come through everything as a stronger and better nation. I see the collapse not as "the end," but as the first step toward improvement. The beard is quite smart IMO. He knows what the market wants but he's teasing the market. CTP, FWIW I'm short from 1232 right now. I feel this is a clearly-definied battle ground, and the stops aren't too far above. You are probably right, but if so that means the Beard actually WANTS the market to go lower because if he wanted it higher he would give 'em what they want. So, in any case the Beard's tough love is clearly a bearish devlopment. 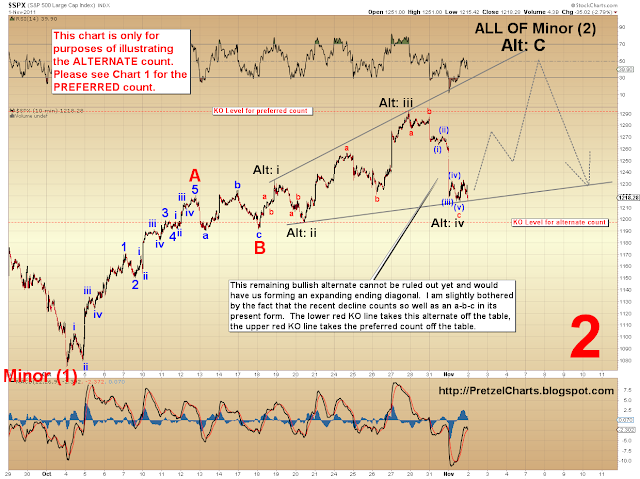 The problem I am having with this now from a cycles standpoint is do we still have time for a 5th wave down and THEN a wave 2 up? I kind of doubt it especially considering that I did not expect the up cycle off yesterday's low to have a very long shelf life and was expecting in to come at the very beginning of the 11/4 +/- 1 window given my other longer cycles that are seeing increasing down pressure every day that goes by. Soooo, now given that the beard has wrecked by plans for a Fed induced pop to short into, I am wondering if we have already topped wave 2 earlier today or will top with a retest of that level early tomorrow. This BLOG is fun it's like a real time market commetary. Bears said MBS purchases are a "viable option" if "conditions are appropriate"
Above should have said Beard not Bears LOL! this market just won't tip it's hand until the final hour...might as well just shut down the exchanges until 3pm est each day. Nothing happens unless it's the final hour or after hours. Annoying as hell. Interesting trivia is that last time there was a dovish dissent was December 2007 which essentially was the top of wave 2 of the first impulse down in the 2008 bear market. History repeating this time? CTP, you're crackin me up. It's funny, we're so desensitized to wild swings that even a 100 point dow move intraday feels like a snail. Someone told me the market often reveals its true character in the final trading hour. Bull markets often open weak and finish strong, whereas bear markets open strong and finish weak. let's see if today's strong open has any follow through. not to sound supremely daft, but beard = ben? I agree with you, but the market loves Fed easing, so I was hoping the Beard would not be so stingy so we could get a euphoric pop to short. I think there is a large number of bears just waiting for this think to tag 1250 before jumping aboard. If we hit it today, I think we reverse off it hard. Maybe a late day zig zag. I hear ya. There isn't a lack of liquidity in the market - there is a lack of demand. The real measures that could help are probably not FED related - but with the election coming up, no-one is going to help the other. An economy that is 70% consumption with stagnate wages, inflation and falling home values - really has no-where to go. Once Europe slows and maybe some of the developing economies - who is left to Buy ? Amen Vulture - Preach the word! I'm not shorting at less than 1,250 myself. And quite frankly I'd like to see 1,275. The market psychology that I'm looking for is sentiment that the bear move early this week has been overcome with eager longs now piling in and feeling all sure and giddy. We're not there right now. But 200 Dow points higher and we will be getting pretty.ose. even if we find 1250 today, I'm getting worried about putting on a short with merkel, sarkozy and papandreou talking tonight. If he backs down, this market could rocket north. I may have to stay flat like Pretzel on this one. A 1275 print I would interpret as bullish...I'd short at 1265, but I'd cover if we threatened above the MA. That level scares me. Call me crazy, but I just shorted NQ (NDX futures). I'm playing with tight stops here, but I think the NDX may turn soon. I get the feeling that the reason the beard is holding back on QE3 is that he wants to have a bullet left in the chamber for when (not if) Greek default happens. NDX cash basis 1214, stops not too far above. I see that 5 waves down off the mid-day high as well for NDX, but it could just be the 'c' wave of a flat B of 2 with C of 2 still on tap. Mid-day high is crucial resistance and 2:00 low is crucial support. One thing that is assured now IMHO is that 11/4 +/- 1 top is NOT going to be above the 10/27 high. Stopped again for -2. NDX looks really impulsive now off the lows. exactly mavrich...another reason that I'm not all that comfortable with holding a heavy short overnight. im still holding on to my FAZ i bought at 37 when the market was near its high, I think that's safe for going long for now. Yeah definitely no rally fuel in Fed saying things are terrible and getting worse AND we aren't going to do anything about it unless things really crash. Way to go beard LOL! I guess he wants to cement his reputation as worst Fed chairman ever. Careful w/ those leveraged ETFs, mav, they tend to get POUNDED when the market goes against you... often they get hit worse than the market prices would suggest they should. If we are going to roll over today, i would think we need to retest the intraday high first. yeah, leveraged ETFs can't be held for too long...they are a bit like the VIX, mean reversion to an extent. Especially the short ones, they don't track the indexes well over the long term. yeah most definitely prez. I lost all my winnings because I didn't set a stop loss on FAZ and the market kept going up and and up and up. Wow that was painful. Bears failed to retake 1230, so up was the only option. Took one last stab here at shorts... I can't resist when I can put stops 2 pts overhead... such a small risk. If the market breaks the HOD, I'm givin' up and going to bed. True, I guess I was hoping for a better beard driven pop than what we got. Short from SPX cash basis 1240... so far so good. I think it was more like the "peach fuzz" LOL! I would at least wait till the close since 11/4 +/- 1 technically doesn't start until tomorrow's open, but I will sometimes front run by taking the trade at the close of the session prior to the turn window opening. Risk is that we get some BS "good news" out of Cannes Merkozy meeting and get a big pop at the open tomorrow. FWIW - market rally on Fed day is typically not very bullish for the next few days. And certainly don't expect some miracle from the ECB tomorrow to save this market. Where'd the Rally Monkey go ? Must be on CNBC saying its a new bull market - buy the banks ! I'm gonna start nibbling short (small position) at the close, and will add to it on any BS Eurozone news related pop tomorrow. If we instead gap down big tomorrow then I will have just have to chase it to add to short position. Bear case would really be looking good if we take out 1190 SPX by the end of this week. jobs report will trigger a sell off. Either way, we're going to tag 1190 at some point for a test. Only way we don't IMO is if this is B down for C up before the crash some weeks away. I don't know about timing, but I would not underestimate the Europeans ability to disappoint. IMO, the Greeks are screwed and they know it. It's just a question of do they take their medicine from the Germans and French, or do they leave Euro and take their medicine from the world as a whole. If given the opportunity to vote (big if), I believe they would vote for the latter. Am still not 100% convinced (only 90%) of a big waterfall decline as outlined by Pretzel, whose been eerily correct as of late. I say that only because of the nonexistence of a serious blowoff top - you know the one where everyone around you has that euphoric feeling of the bulls return, and mocks you for being wrong, so much so that even you turn bullish. I get scared when I'm right to many times in succession, I guess that's from being wrong so many times. Anyway, thoughts from the abyss of my brain.